From idea to IPO and beyond, AWS sets the standard for education technology applications. 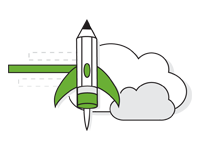 The AWS Cloud lets EdTechs build and launch solutions that help students learn every day. EdTech companies can start, grow, and optimize their businesses without the headache of expensive infrastructure. The AWS Cloud provides the flexibility and agility needed to experiment, reliably serve students at scale, and manage district or university operations. Reduce costs with the AWS pay-as-you-go model. Your business can plan for growth or increased demand from seasonality. AWS gives you the option to budget according to your needs. Gain the assurance that capacity will be available for all of your users’ needs, without having to overprovision or risk failing to meet demand. The AWS Cloud offers even the most mature EdTech companies the power to optimize their solutions for cost, security, fault tolerance, and improved performance. Between AWS Support, well architected reviews and other services, it’s like having a personalized cloud expert for your business. Educational technology companies are on the front lines when it comes to protecting student data security and complying with government regulations for accessibility. With the AWS Cloud, your solution benefits from one of the most flexible and secure cloud-computing environments available today. AWS helps you index documents and deliver static, streamed, and dynamic content wherever students live and learn. On-campus and remote students share the same experience with the AWS Cloud, with reduced latency and high data-transfer speeds. If you’ve got a big idea for a company that can change education, AWS EdStart can help. AWS EdStart is a new program that helps educational technology startups build innovative teaching and learning solutions using the AWS Cloud. The program provides qualifying companies with AWS Promotional Credits, office hours, trainings, and community forums for startups dedicated to education. To help ensure you’re set up for success as you build with AWS, we put together this quick reference guide for Big Data training and resources available here on the AWS site. With more than 145 partners and over 2,000 classes on its website, Coursera needed to track student data, store and deliver videos, and enable students and teachers to interact with each other. By using AWS services, Coursera can handle half a petabyte of traffic each month and scale to deliver courses to over 21 million learners from around the globe. Working with AWS enables Ellucian to efficiently deploy products in more than 20 countries around the world. Security and scalability were key elements evaluated when Ellucian chose AWS, because of Ellucian's relationship with a broad range of higher-education institutions and the sensitive student data its customers manage. The AWS Cloud lets startups take advantage of a complete technology platform while running lean and staying agile. From day 1, AWS lets you build cutting-edge educational solutions and mobile apps, tap into a global infrastructure, and save precious dollars. See how Code.org scaled from zero to 20 million students in one week, inspiring students worldwide to start coding. Stay up to date on the latest education news from AWS. Discover, purchase, migrate, and deploy software solutions on AWS. Get the business software you want in minutes and pay only for what you consume. Educational technology companies of all types and sizes rely on AWS. Contact our experts and start your own AWS Cloud journey today.